To fans of the National Hockey League (NHL), John Tavares needs no introduction. The Canadian sports star has been playing ice hockey professionally since 2009. He has enjoyed a quick rise in his career and in 2018 made the headlines with his big 7-year contract with the Toronto Maple Leafs. He previously played for the New York Islanders for nine seasons serving as team captain in his first five seasons. Here is a look at how his career has fared over the years as well as some key facts about his wealth from the sports and his romantic life. John Tavares was born to his parents Barbara and Joe Tavares on the 20th day of September in 1990 in the Ontario town – Mississauga. Tavares has Polish and Portuguese roots from his mother and father’s side respectively. Tavares grew up in Oakville, Ontario and attended St. Thomas Aquinas Catholic Secondary School. It was at Oakville that he got his initial exposure to minor Hockey through the Minor Oaks Hockey Association. Tavares also played other sports which included soccer and lacrosse but hockey won his heart most. His love for lacrosse was fueled by his uncle and namesake, the legendary John Tavares who left his footprints in the sands of the National Lacrosse League (NLL) times. While his uncle played for the NLL’s Buffalo Bandits, young Tavares served there as the ball boy. Just like his uncle, younger Tavares excelled at Lacrosse and attributed his success in Lacrosse to his uncle who taught him the significance of being unselfish. He stated that accompanying his uncle and his team, the Bandits had a significant impact on him as a hockey player and as an individual. Growing up in Oakville, John Tavares became friends with a certain Sam Gagner who lived just 5 minutes away from his own house. Tavares’ friendship with Gagner would prove to be pivotal in his formative years as an ice hockey player as he got to train regularly with Gagner at their backyard ice rink. Gagner’s father, retired pro NHL player, Dave Gagner had built the rink to get his son ready to follow in his footsteps. Thanks to those regular training, Tavares’ skills awed his parents so much so that they decided to upgrade him to a higher age group where he was equally well playing with older kids. In the years that followed, Tavares would come to showcase his skill for GHTL teams like Mississauga Braves; the Mississauga Novice team (1998-1999); the and the Mississauga Senators. He led the later to the 1999/2000 minor atom championship. He would eventually play for the Toronto Marlboros (2003-04); where he became teammates with his childhood buddy, Sam Gagner. John’s contribution to the team saw them win the 2004 Bantam AAA Provincial Hockey Championships. With 95 goals (187 points) scored in 90 games, John Tavares was named the best forwarder of the tournament. On 15 July of 2009, John Tavares went professional signing a three-year, entry-level contract with the New York Islanders who had selected him first overall in the 2009 NHL draft. On his pro debut on 3 October 2009 in a match against the Pittsburgh Penguins, John Tavares, as expected netted his first of many goals to come. By September 2011, he had impressed his team enough to earn a 6-year contract extension and subsequently was named the team’s alternate captain. He ended his time with the team in July 201 when he signed with the Toronto Maple Leafs. Tavares is married to Aryne Lynn Frances Fuller in 2018. She is known to have kept him company in 2014 at the Sochi Olympics. She graduated from the McMaster University with a bachelor of science in Kinesiology and also obtained a masters in Rehabilitation Therapy and Physiology from Queen’s University in Ontario. Much is not known about her as she appears to be a private person and does not appear to own a neither a Twitter account nor an Instagram account. As John Tavares’ career has grown so as his salary from the sports. Upon the signing his seven-year contract worth $77 million with the Toronto Maple Leafs, his salary surged to an average of $10 million per season up from $6 million earned in the 2015 season. The deal came with a signing bonus of $70,890,000. His net worth has been estimated at over $20 million. • John Tavares scored his first career hat-trick came in a loss to the Florida Panthers on 23rd of October 2010. • Tavares scored his first career National hockey league playoff goal against Pittsburgh in game 3 of the 2013 Stanley Cup playoffs on 10 May 2013. • He turned down a higher paying offer of a seven-year, $91 million contract from San Jose Sharks in favor of joining the Maple Leafs. 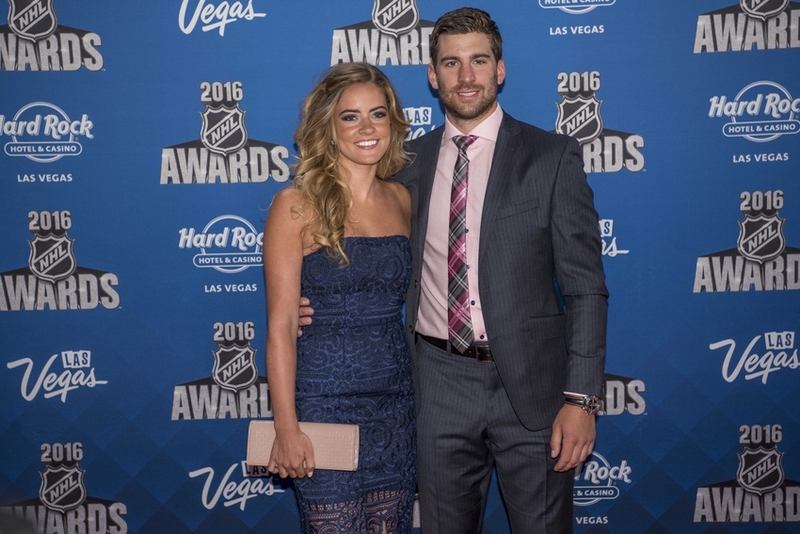 • John Tavares stands at a height of 6 feet 1 inch (1.85 m) tall and weighs approximately 209 lb.